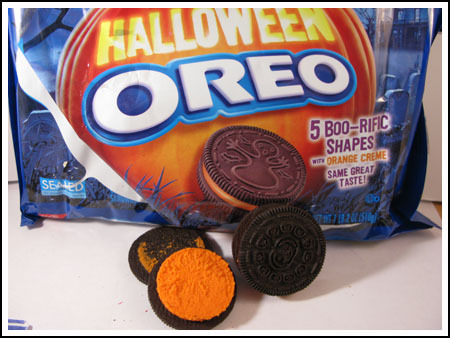 You know Halloween’s around the corner when the orange and black Halloween Oreo Cookies start appearing on the shelves. Pretty garish, eh? Or maybe just cute. Or maybe a little of both? 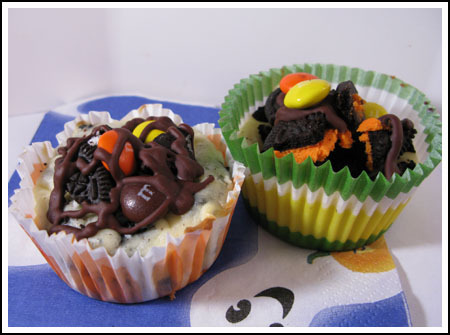 I love them nonetheless, and was so happy to find an excuse to use them in these Mini Halloween Oreo Cheesecakes. The recipe was adapted from one called “All to Myself Cheesecakes”. But I think with the Halloween Oreos these are just too cute to keep to oneself. In a small saucepan, melt chocolate pieces with shortening over low heat, stirring frequently or melt the chocolate using a low heat setting on microwave. 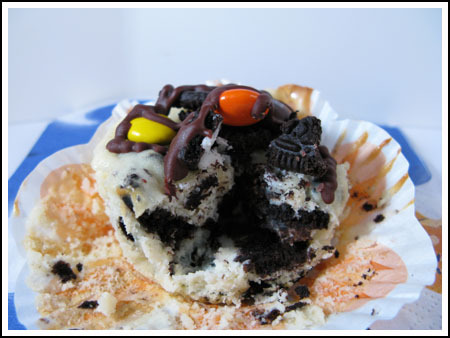 Drizzle the melted chocolate over the tops of the cupcakes or if you’d like, stack more broken Oreos over the top of the cupcakes and drizzle the chocolate over them. If you’ve going to do that, then you might as well add the M&Ms. i made these last night for my daughters’ lacrosse practice today and they were a HUGE hit! i portioned them with my cool new ice cream scooper that i got for my birthday from williams sonoma and i have to tell you that it was EXACTLY the right amount! and i doubled the recipe!!! News to me. I’ve never seen Halloween Oreo’s. I actually had my first Deep Fried Oreo this summer. Imagine these deep fried. Oh my goodness!!! Hm. I like that bright orange. Scary! Anna – did you cook these in a muffin pan or just in muffin liners set on a cookie sheet? I think these will have to be on the menu for the Annual Pumpkin Carving Party!!!! These look great and easy, and I can foresee the basic ratios being used for other candy/cookie combos: like Nutterbutters & Reeces Pieces, Mint Oreos and chopped Peppermint Patties. Hey…I am from the Midwest! I am all over that cheesecakes for me! and handling preferred! The economy an all! For some reason the Halloween Oreos are my favorite! These look so cute and so yummy. Oreos are a weakness of mine. I’ll have to give these ones a try. Liz, maybe we could shorten that goo “TFC”. Do you think it would catch on? Palidor, I see that you are in Canada — land of delicious cookies. Sorry the Halloween Oreos haven’t made their way up north yet. You can still make these. Just use Halloween colored M&Ms. Matt, that would be good too. You could marble orange with the white. Love that idea. Dawn, I love summer and but am ready to bid it adieu. Bring on the cold! So cute, they look great! I love everything about fall, including Halloween! Wow, I’ve never seen orange oreos before. The cheesecakes look very sinful! Ah, Halloween. This recipe calls for orange food coloring!